√Anyone who has done electronics repair knows how irritating damaging desk and lost screws can be. If you are lucky, you will end up all those troubles with this portable soldering pad. √Designed by fixers, for fixers, the 13.8 x 9.8-inch soldering mat solves this repair problem. Spacious and secure, with different sizes of "compartments",the soldering mat will hold screws as you pull them out of a device, best gift for techie! it can maintain good daily use, very easily cleaned nice with wet cloth or wet tissue if get dusts. but also suitable for electronics lab, computer maintenance outlets, large-scale production of electronic products workshop etc. At BTSHOW, we only make high quality products with most competitive price for our customers all over the world. 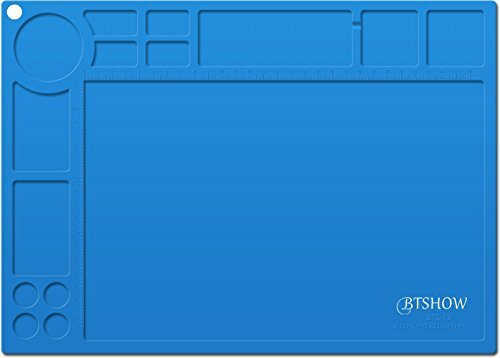 Notice:If you need an anti static ESD silicone mat, please search BTSHOW ESD mat :Designed for an electronic assembly where static charge is a concern. SILICONE HEAT RESISTANT MAT: Up to 932°F(500°C),perfect for soldering wok and electronics repair. ELECTRONICS MAT:Different shape compartments as containers to organize the semiconductors and small elctronic components,easy to find and make your working surface clean and neat.Built-in engraved L-shaped square ruler 28x18cm(11"x7") can measure your devices any time. SOLDERING MATERIALS:Made of FDA food grade silicone which is flexible and durable,better than rubber mats.And it was sprayed with dustproof oil which magnets no dusts/lints etc. UNIVERSAL SILICONE MAT: Dream partner for soldering station, heat gun, soldering iron,hair straightener,flat iron,curling iron,heat table wares and other hot styling tools,applied to Kitchen, baking house,salon etc.,almost everywhere you think it helps. WHAT YOU GET:1 X silicone soldering pad/mat, Life Time warranty and friendly customer service from BTSHOW. If you have any questions about this product by BTSHOW, contact us by completing and submitting the form below. If you are looking for a specif part number, please include it with your message.